Uruguayan American School is an American international school in Carrasco, Montevideo. It serves nursery through grade 12. As of 2015 it has 320 students, including Uruguayans and people of other nationalities. 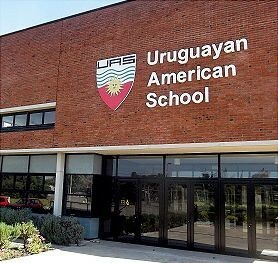 The Uruguayan American School (UAS) is a private college preparatory school enrolling approximately 320 international and host country students in Nursery through Grade 12. Our mission is to be a multicultural, academically challenging learning community that prepares students to be responsible global citizens and lifelong learners through U.S., international and Uruguayan curricula. UAS offers a unique educational opportunity unlike any other school in Uruguay, public or private. Founded over 57 years ago, UAS caters to both international and Uruguayan families by providing an international curriculum taught entirely in English and a Uruguayan curriculum for students who plan to attend a university in South America.